For Rockfish, A Tale Of Recovery, Hidden On Menus : The Salt Once depleted by decades of overfishing, rockfish have rebounded. But it's hard to tell this conservation and fishery management success story if purveyors continue to misidentify the tasty fish. It's a conservation and fishery management success story that chefs, distributors and sustainable seafood advocates want the world to hear. The rub? It's hard to communicate this success if purveyors continue to misidentify the fish, as many do. Now, this isn't necessarily a case of retailers and chefs being shady. A big problem, says chef Rick Moonen, owner of RM Seafood in Las Vegas, is that fish go by different names in different places. Take rockfish, for example. "On the East Coast, they call striped bass 'rockfish.' You offer them a chilipepper," Moonen says, citing the name of one rockfish species, "and call it a 'rockfish' and they'll think they're getting a striped bass." Moonen is well known as a sustainable-seafood advocate. And he's eager to tell the story of rockfish's comeback, a result of tightened fishing restrictions and a reduction in the number of commercial trawlers raking the ocean bottom in pursuit of the buggy-eyed, spiny-backed fish. But he says many diners are only familiar with a handful of fish species, and rockfish can sound "like an animal from the Flintstones cartoon." If the goal is to get consumers to develop a taste for these fish, Moonen suggests, you've got to market it to them in an appealing way. So for now, on his menu, rockfish are still being sold as "Pacific bass." "That's ... the Trojan horse we use to get this fish into people's mouths," he says. That said, Moonen says he plans to transition to using real names for rockfish. 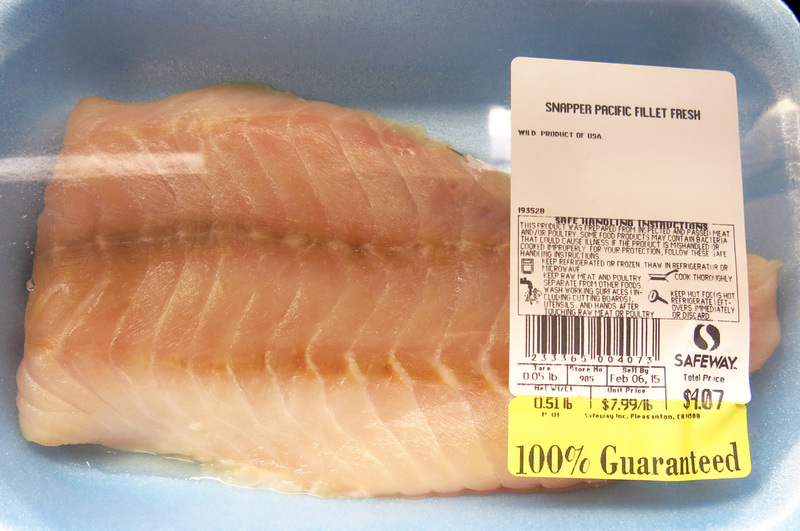 Name That Fish: A wild U.S. fish being sold as "Pacific snapper." Snapper is rarely found north of Mexico, and some rockfish species are often sold as "snapper." In these cases, it's not quite fraud, because consumers understand what each market name means. As Derek Figueroa, chief operating officer with Seattle Fish, a distributor in Denver, observes, "It's like asking for a Kleenex and getting some other tissue. It might not be what you asked for, but it's what you had in mind." Not always, says Kim Warner, a senior scientist with the environmental group Oceana. She notes that rockfish is sometimes sold as snapper — but "snapper" is the name of another group of fish, which live in warm waters and are exceptionally tasty. "What if someone who is familiar with real snapper comes to California?" asks Warner. "They'll think they're getting snapper. This absolutely confuses people." The debate over what to call rockfish comes as American consumers are increasingly demanding accurate information about their food and where it came from. And even if they don't, correctly identifying fish on menus and in markets is the first step toward creating traceability in the often deceptive and murky fishing industry, says Sheila Bowman of the Monterey Bay Aquarium's Seafood Watch Program. "The only way to recognize and appreciate these fish is to start calling them by their proper names," says Bowman. Oceana's Warner notes that some instances of seafood mislabeling — such as calling farmed fish "wild," or serving up a fish containing high mercury levels under an ambiguous label — are deceitful attempts to hide traits that might be seen as undesirable. "If they're celebrating that rockfish are doing well, why call them snapper?" Warner says. "You lose the story you're trying to tell." Bowman says that on regular strolls through the seafood markets of Cannery Row, in downtown Monterey, Calif., she sees rockfish of all colors labeled as "snapper" and "rock cod." Sometimes, chefs and vendors avoid the fishes' real names because they are a mouthful for diners — like vermillion rockfish, bocaccio rockfish, chilipepper rockfish and shortbelly rockfish. But Figueroa at Seattle Fish says he's excited to start using these exotic — and accurate — names. "I think it's more interesting to use the real names," Rorapaugh says. "If you have thornyhead rockfish on the menu, it will start a conversation." 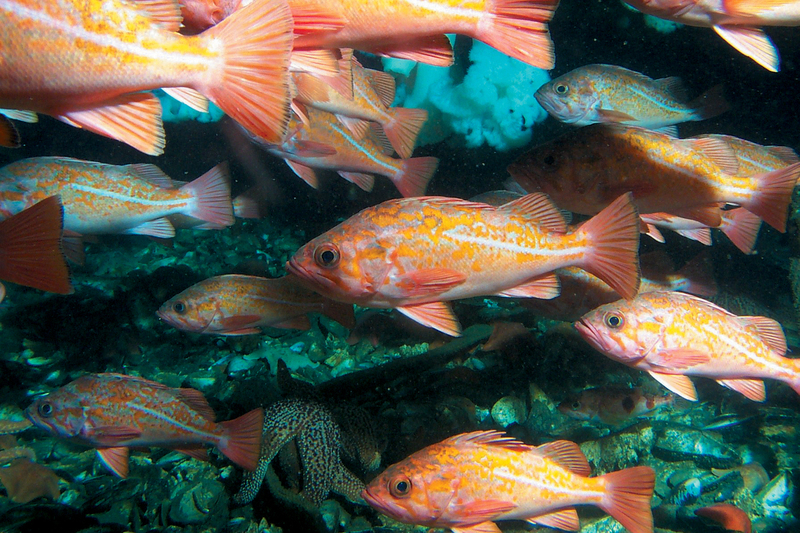 "If rockfish fishermen are happy and making money, other fishermen will see that [the recovery efforts used for West Coast rockfish] could work in other places," Bowman says. "But if fishermen are just getting a couple of bucks a pound for these fish, then the effort we made to bring this fishery back won't be worth it."